“Sometimes we experience a terrible dryness in our spiritual life. We feel no desire to pray, don’t experience God’s presence, get bored with worship services, and even think that everything we ever believed about God, Jesus, and the Holy Spirit is little more than a childhood fairy tale. People often recommend books, especially for summertime readers. I’d like to mention three that have helped renew me this summer. First, LET THE FIRE FALL by Fr. Michael Scanlan, T. O. R. It’s the story of how the power of the Holy Spirit revolutionized the life of Fr. Scanlan and Franciscan University. I believe this book will convince you the Holy Spirit can do the same for you. The next book is a wonderful read by an exorcist. Get your attention? Well this book is worth your attention. 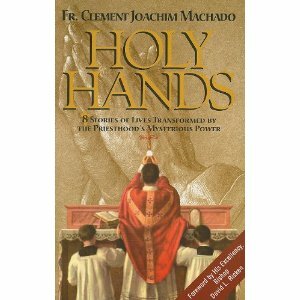 It’s HOLY HANDS — Stories of 8 Lives Transformed by the Priesthood’s Mysterious Power. It is written by Fr. Clement Machado who has done something over 1,000 formal exorcisms and as many as 3,000 healings and deliverance ministry sessions. In conclusion, I might say that I am continuing to go to Friday Adoration before the Blessed Sacrament. Adoration has become a special gift to me and I can’t recommend it highly enough. If you don’t feel like you get anything out of Adoration, or if you don’t really know what to do in that quiet, I recommend you Google ‘what to do in adoration.’ You’ll find link after link with information to explore about developing your approach to Adoration. Here’s one good link: www.maronitemonks.org/articles/February2006.pdf The article is entitled 48 Things to Do at Adoration. Put a ‘bounce’ in your steps. Jesus is walking with you. On the beach. In the mountains. At the park. At the pool.